I was lucky enough to catch a screening of it at a fundraising event for San Diego’s Horrible Imaginings Film Festival and Director Jeremy Foley and Producer Sara O’Reilly agreed to sit down with me and discuss the film and their creative process. TMS: First, Can you tell me about the inspiration for the film? JEREMY: The inspiration for this film was actually a short story written by my father. He wrote the story around 2007 or 2008, in the middle of the American housing crisis and Great Recession and I think it was his way of commenting on the loss of identity and disillusionment that so many people were feeling at that time. I didn’t read it until several years later and at that time Sara and I had made our previous short film and were looking for something else to do before trying our hands at a feature. I wanted to do another short film to build up my skill and technique before making that leap, so we were tossing out ideas for what to make. And I remembered this story and I showed it to Sara and she was the one actually who said let’s do this; let’s go after this. Both of us were really compelled by the idea and so we said if we can pull this off, it would be really cool. SARA: I remember when I first read the short story, I thought the concept was so unique and such a great allegory for someone who is experiencing a loss of identity. But what I really responded to the most was the humor in the story. Jeremy’s father created this really fun, whimsical tone that felt right and we wanted to try to replicate in the film. It wasn’t a horror story or too grounded in reality. There’s an element of fantasy - that you just need to go along for this bizarre ride with this guy who has had his face transformed into a mirror. So that was something we worked a lot on in the screenwriting phase, to make sure that we captured the very real themes and ideas, but preserved the fun quirkiness. TMS: Why did you decide on practical effects over digital for the film? JEREMY: Once we decided to attempt to make the movie, there were a bunch of hurdles that we needed to jump over before we could turn it into reality. The first was how to make a man with a mirror for a face. We did consider doing it digitally but it became apparent pretty quickly that in order to get the realism that it required, it was going to be prohibitive in that it would take us ten years to finish or would be really expensive, honestly. And for an independent short film, we didn’t have an unlimited budget. Plus, since we loved the surreal nature of the story, we thought let’s lean into it and just have practical effects and makeup (which we appreciate and think looks better anyway). The pendulum has swung so far with VFX and CGI that audiences are becoming jaded and it’s not working as well, we believe. You can see in big films like the new Star Wars, people are trying to bring it back to practical effects or a blend of the two because nothing can beat that realism to the audience’s eye. And once we did decide to take it back to old school technique, we really embraced that idea across the board, so our art direction, our key art, our music, our color correction all has a very throwback 60s vibe, which we thought all meshed together. SARA: We all were leaning towards the practical effects route, so we did lots of tests to make sure that it would actually work on camera. 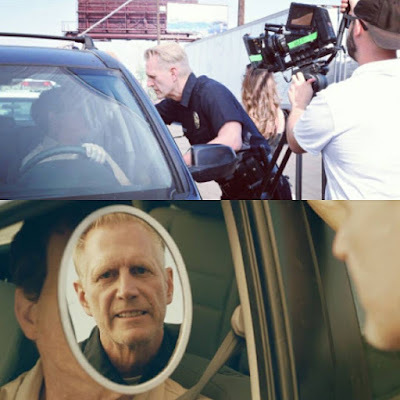 We have a bunch of fun behind-the-scenes videos on our website (adjectivepictures.com) from us in pre-production, showing me holding a piece of two-way mirror up to my face as we do camera tests. And we learned so much about filming with mirrors. For example, there’s a really weird optical effect that happens with reflections in a mirror in that no matter how close or far away the camera is from the mirror, the person or thing reflected in it will stay the same size. It’s the person or thing’s distance from the mirror that changes their size. So all of this testing was invaluable to us before we did actual production. And so once we determined this crazy idea could theoretically work, the next step was finding someone who could actually fabricate it for us. We were introduced to a Special Effects Makeup company called Rogue Planet Laboratories who worked with us to create the prosthetic mask. Ian Goodwin, the owner, had certainly never done anything like this (and to the best of our knowledge no one has) but he was game to help us figure out all of the practical and design elements we envisioned. For example, it was really important to us that we be able to take the mirror on and off so our actor Billy could eat, drink water and cool off. So Ian ingeniously built magnets into the prosthetic, which attached to the two-way acrylic, and we were able to pop it on and off between takes. 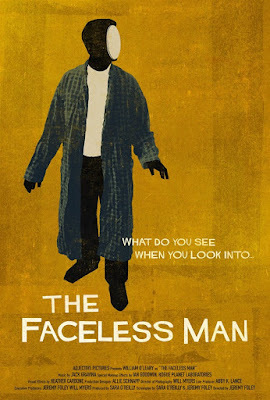 TMS: When The Faceless Man was screened at the Horrible Imaginings Fundraiser, you talked about the positive mood of this film and your feelings on cynicism. Can you discuss those feelings a little? JEREMY: That’s something that’s very important to me and I think that’s important to our company, Adjective Pictures. The stuff that we make is not too cynical. And even in my personal life if I catch myself being cynical I try to stop it. Because I think that cynicism is a way for people to hide their true feelings and I think it can get boring and predictable actually. It’s a layer that sits above the real issue or truth and so it’s not that interesting to me. I’m interested in the reality and heart that’s underneath. SARA: I think this goes back to tone too. The tone in the short story was not cynical or fearful. The man was not freaking out, trying to rip off the mirror or drive himself to the emergency room, which is realistically what you may do. Or check yourself into an insane asylum, ha. He is clearly depressed in the story and the film, but these feelings are manifesting themselves in an unusual, and sometimes humorous, way. And the journey he goes on helps him to work through these feelings and regain his identity. We like that people watch the film and are surprised by the hopeful and heartfelt resolution. They go into it expecting this surreal, bizarre film but walk away feeling good, or that’s the hope at least. And that’s our goal with this film and with a lot of our work. We both are attracted to films that have a lot of heart. TMS: The Faceless Man is not only about a man without a face but it also has something to say about the dynamics of marriage. Have any aspects of your marriage been an inspiration in the making of the film and what is it like working as a husband and wife team? JEREMY: The married couple in The Faceless Man wasn’t really inspired by our marriage but more so my parent’s marriage, since it was my dad’s story. But we do understand what a married couple is like and that sometimes one person can be the stronger person in a relationship and vice versa, it changes. In a real relationship, sometimes you are up and sometimes you are down. So we definitely understand that dynamic. SARA: And we definitely experienced those ups and downs while making this film. This was a super challenging shoot as you can imagine, filming practically into a mirror for 99% of the time. So we needed to support each other. But we’ve made a few projects together now and we find that we balance each other out pretty well. We see things from different perspectives but always towards a common goal. And it is nice having your filmmaking partner in the same house. We both have day jobs and indie filmmaking can sometimes be a 24/7 job that you have to fit into your free time, so it’s nice having the other person there to bounce ideas off of and motivate each other. TMS: What is the path The Faceless Man has taken and what are your hopes for its future? JEREMY: The Faceless Man has had a successful festival run, which we’re really proud of because we wanted to get this unique story in front of as many audiences as possible and also help build awareness for us as filmmakers. Now we’ve released the film online and we’re excited to see what people’s reactions are and where that takes us as we hope to continue to build awareness of the film and our company, Adjective Pictures. 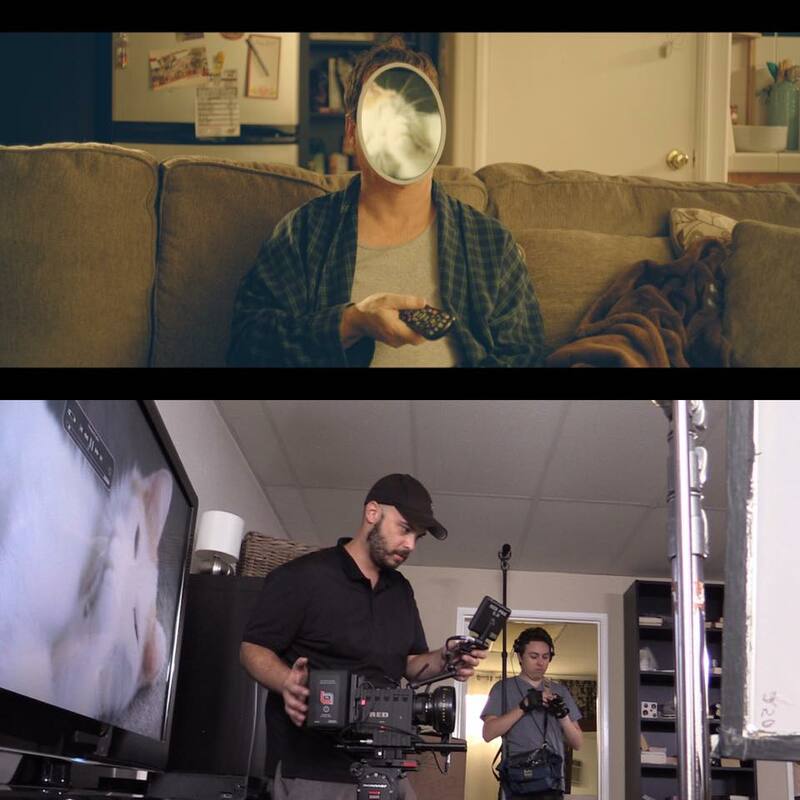 Like a lot of short filmmakers, our next goal is to make the leap to feature films and we have several feature film projects in development. SARA: Jeremy and I have made two short films that are really big in scope (our last short film, FATED was Academy Qualified, distributed by ShortsHD and is available on VOD and iTunes) and we are currently developing a feature film that is in line with our past projects, a combo of offbeat and heartfelt. 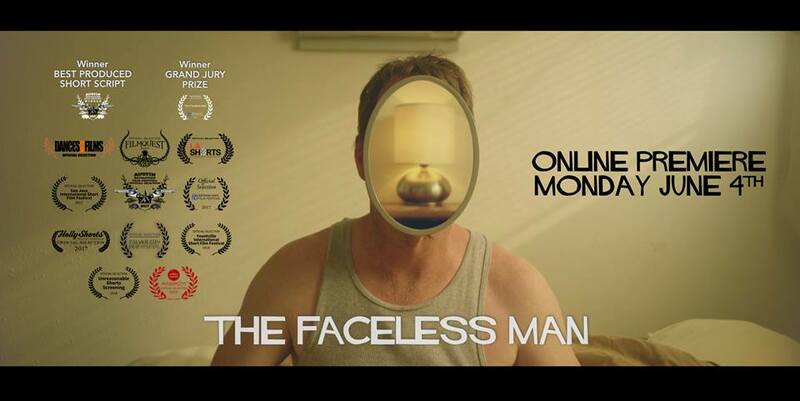 We hope The Faceless Man will bring the attention of some representation to help us take the next step with our feature. TMS: What would you like the audience to learn or gain from the film? JEREMY: Even though the story was written ten years ago, we still feel a lot of the themes and ideas are relevant. There are certainly a lot of people out there who could use a dose of self-reflection. The world and the country is so divided and everything is so divisive, I think we could all stand to be a bit more understanding and be aware that everyone is struggling with their own inner demons. All that being said, we tried to not shove the message down viewer’s throats. We liked wrapping these themes up within this whimsical, fun journey and just hope that our audience will really reflect on those ideas (pun intended). TMS: Finally, do you have any recommendations for other aspiring filmmakers? JEREMY: After you’ve finished a project, make sure you have your next project ready to go because that’s always everyone’s first question – “what’s next?” That is the most common question you will get and you better have a good answer. SARA: It’s so true. You just finished this huge undertaking that took months or years of your life, you’re ready to finally present your film to the world and want to just enjoy the fruits of your labor. But the reality is everyone wants to know what’s next. Which is a good thing, maybe it will be your next collaborator or someone that sees promise in you and wants to get in on your next project. So just be prepared with that answer and open to where those connections take you.